Baptism is the first moment of the rest of your life! Baptism is a pivotal moment in the Catholic faith, as it is the gateway to life in Christ and life in the Church! We are delighted to help your family through baptism, but we understand baptism to be much more than just an event. Baptism is our challenge to live a Christian life and to grow as a Catholic family, and so we take this commitment seriously. To help your family with baptism and the life it calls us to lead, we have designed a preparation session to help you. If you, another adult, or your older child are interested in being baptized or becoming catholic, please visit the RCIA page. Baptisms may occur during or after a regular Sunday mass. You may also call the parish office to schedule. 937.254.6233. 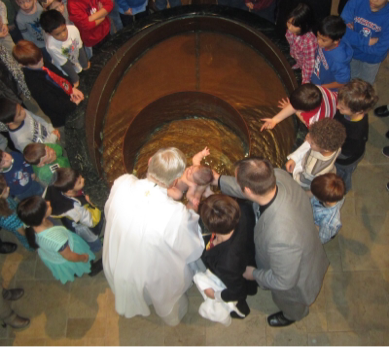 Infant baptism by partial immersion, 2013.